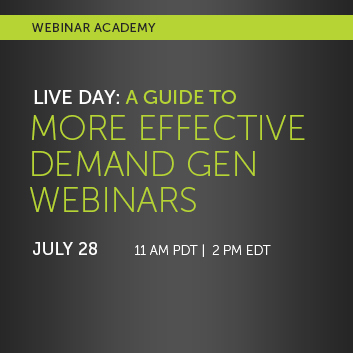 Attend the Webinar Academy live day, “A Guide To More Effective Demand Generation Webinars,” and learn to deliver webinars that drive leads and boost audience engagement. The Webinar Academy is your one-stop resource for training and certification for creating and delivering successful webinars. With more than 30 years of professional experience, Ken has presented public sessions at numerous industry conferences, as well as presenting information to customers, sales prospects, industry analysts, and the press. Ken offers consulting and training services through his company Webinar Success (www.wsuccess.com). He is also a prolific blogger on the subject of web conferencing and its applications in The Webinar Blog (www.TheWebinarBlog.com). He has been quoted in the Wall Street Journal and industry publications as well as making frequent public presentations on the topic of more effective webinars. As Vice President of Corporate Marketing for ON24, Mark manages the brand and content strategy in support of webinar marketing solutions. Mark brings over 20 years of marketing, sales and brand management experience with leading technology firms, including: ON24, Cisco, GE Access and Compatible Systems.